Our Anchor Tiedown System (ATS) for shearwall overturning restraint addresses many of the design challenges specifically associated with multi-story buildings that must withstand seismic and high wind activity. For your project, you will want to implement drawing details that will assist you during design and construction. In addition to the run start and run termination details shown on pp. 42–46, Simpson Strong-Tie offers general details that can be found at strongtie.com/srs as well as our general detail sheets that are provided with our complete ATS design package. 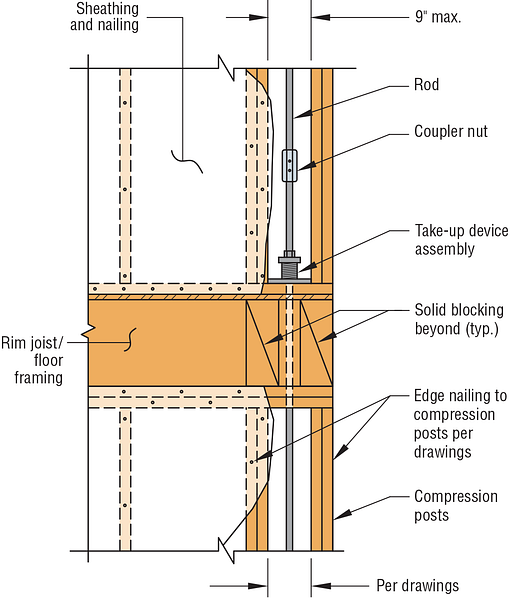 Below are two common run details; the rod offset detail and the mid-floor blocking detail.